Pat McGill, left, Rose Nowak, Sandi McCarthy and Judy Kubasak together made up one of the more than 30 teams of golfers whose participation made the 2015 Lorain Sports Hall of Fame Golf Outing a success. 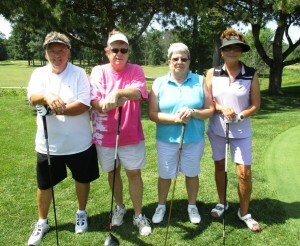 Nearly 130 golfers enjoyed perfect weather on Aug. 2 at the Lorain Sports Hall of Fame Golf Outing. The annual event benefits the work of our organization, our museum and J. Ed Uland Award scholarships for outstanding high school scholar-athletes in Lorain. We offer our sincere thanks to all the golfers who participated and to all the other people whose help made for a pleasant event at the Fox Creek Golf and Racquet Club in Lorain. Click here to check out all the golfers and other sights in the photo gallery. Eddie Williamson accepts the J. Ed Uland Award from the Lorain Sports Hall of Fame at the 2015 banquet. Check out the video of the May 2, 2015, Lorain Sports Hall of Fame Enshrinement Banquet now posted online at the LSHOF YouTube Channel, and when you’re there please subscribe to the channel to see videos of future LSHOF events. Just click on the link here to go to the LSHOF YouTube Channel. The Lorain Sports Hall of Fame is now accepting nominations of athletes for enshrinement in the LSHOF Class of 2016. Deadline to apply is Sept. 30. Nomination forms can be obtained online at www.lorainsportshalloffame.com/nomination-process/ or picked up in person at the LSHOF Museum. The museum is in the lobby of the St. Joseph Community Center at W. 20th Street and Livingston Avenue; it is open from 10 a.m. to 1 p.m. on Mondays, Tuesdays and Thursdays. To be eligible, a nominee must be a current or former Lorain resident, at least 35 years old in 2016, with an outstanding record of sports achievement that can be documented. Nominations must be submitted by members of the general public. Full details are on the nomination application. Those chosen will be inducted at the enshrinement banquet on May 5, 2016. The Lorain Sports Hall of Fame was founded in 1969 to honor those who represent the best in Lorain athletic achievement from high school onward. Read the benefits and simple process of sponsoring a hole at the LSHOF Golf Outing. We’ve added a gallery of more than 100 photos of scenes from the May 7 Enshrinement Banquet. Take a look here and see if you can spot yourself. For more on the banquet and the new inductees, click here.